William Penn, the English Quaker who founded the city, had a vision for the land that would eventually become Philadelphia. He had a dream of a place where men of all different colors and backgrounds would unite in order to live together in a community peacefully. 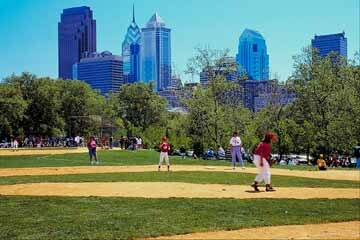 Today, the city of Philadelphia is commonly known as the City of Brotherly Love, but that does no mean that the city has not had its share of difficult times. When the Revolutionary War hit Colonial America, many of the residents of Philadelphia sided with Britain. These colonists quickly became known as turn coats or Tories. Since the war that gave the colonies their freedom, Philadelphia has played a large role in many political matters. The Articles of the Confederation were drafted here as was the Constitution of the United States. Philadelphia also played host to the first Republican Convention in 1854. Today, Philadelphia is a major mover and shaker on the east coast of the states. Because of its strong relationship to this country's beginnings, in addition to the wide array of cultural opportunities, Philadelphia has become a major tourist destination. The city of Philadelphia takes immense pride in the role that it played in giving birth to the United States as a free country. There are numerous sights and tours around town that pay homage to this exciting time in American history. Independence Hall was originally the Pennsylvania State House and the location of the colony's headquarters. It was here that the founding fathers met to sign the Declaration of Independence. Other important milestones took place in this building such as the approval for the design of the fledgling country's flag, the drafting of the Articles of Confederation and the development of the Constitution. Liberty Bell remains Philadelphia's most frequented tourist attraction. The inscription on the 2080 pound bell reads, "Proclaim liberty through all the land, to all the inhabitants thereof". The bell was rung to draw attention to important occasions such as the first public reading of the Declaration of Independence in nearby Independence Square. 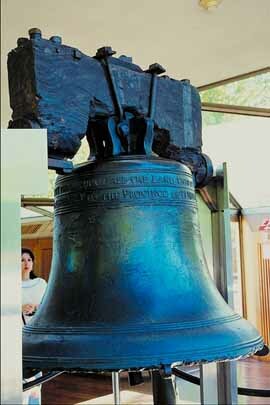 The bell has not been rung since 1846 after it became cracked while tolling in honor of George Washington's birthday. Located next to Independence Hall is Congress Hall. 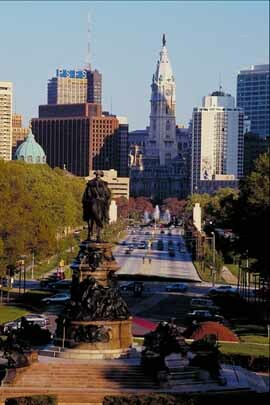 Philadelphia was originally the capital of the United States. This was the sight of George Washington's inauguration as the first president of the United States. 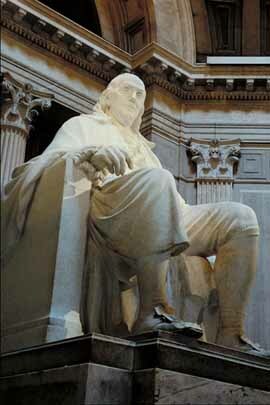 Franklin Court is the home and workplace of one of the country's major contributors, Benjamin Franklin. His numerous inventions can be seen at an underground museum located at Franklin Court. Once the second bank of the United States, the National Portrait Gallery now displays works done by Charles Wilson Peale who is responsible for creating the best portraits during the time of the American Revolution. The first edition of the Declaration of Independence is on display here as well. All of the historic sights mentioned above are a part of Independence National Historic Park. History lovers will be absolutely dizzy from immersing themselves in all of the sights to be seen. Other various historical points of interest include the Betsy Ross House, the US Mint and the oldest residential street in the nation with colonial-style homes dating as far back as the early 1700's. These attractions can all be seen in Old City, the original Philadelphia. Not only does Philadelphia celebrate its rich past, but the city also beams as a result of its diversity. South Philadelphia became home to an influx of immigrants who arrived in the city during the 17th, 19th and 20th centuries. People from Dutch, Swedish, Italian, Jewish and Asian descent call this area home. To get a feel for this community's uniqueness, head over to the Italian Market. The majority of the vendors are Italian but a great number of them are also from other backgrounds. The wares that they sell are an excellent display of the diversity that is such an integral part of Philadelphia. To learn more about two different groups of this mixed community spend some time at the National Museum of American Jewish History or the Afro-American Historical and Cultural Museum. In addition to the numerous museums that outline the historical importance of Philadelphia, the city also has some wonderful art museums. The Philadelphia Museum of Art has collections representing styles such as Impressionism, Cubism and Post-Modernism. Shoppers will appreciate the variety of options. Philadelphia has everything from high-end retail and quaint boutiques to flea markets and second-hand stores. There are so many wonderful restaurants in the city that no matter what kind of meal your palate craves, you'll be sure to find it in Philadelphia. This city has a lot for everyone, so get ready for the trip of a lifetime.